New Bradwell's season has been a struggle so far, finding themselves bottom of the pile. Taking on Great Horwood at home on Saturday, they knew a win would be essential in helping them remain afloat this season and they did so in some style. James McMillan (3-39) and Mohammed Shahid (3-27) tore through the top order, with the visitors toiling on 38-6. Despite a reprise in the middle of the order, things did not improve for Great Horwood until the ninth wicket stand which saw Simon Ridgway (61 not out) and Haydon Morrison (13 not out) put on a 57-run partnership to salvage the innings as they closed on 161-8. The reply though would be one-sided. Timms' unbeaten 120 eclipsed even fellow opener Charlie Maw, who was not out on 30 at the other end, as New Bradwell eased to 164 without loss. The result means New Bradwell are now just four points behind Great Horwood and six from Division 1 safety. That spot is currently occupied by New City as they pulled off one of the shock results of the day, beating high-flying Milton Keynes. A partnership worth 118 runs between Viral Shah (55) and Manjit Singh (58) saw New City go from 118-6 to 236-7 before closing on 239-8. 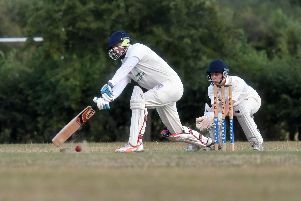 In reply, MK's Nick Hillman hit 79 but his was the sole highlight from an otherwise poor innings. Three wickets apiece from Jay Singadia and Shalin Parikh reduced the away side for 152 - 87 runs shy of victory. 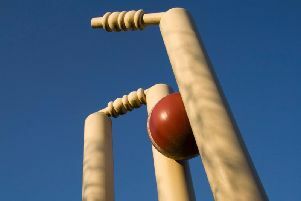 The division's other shock came when leaders North Crawley lose by Westcroft by 12 runs.Iqbal John hit 55 at the top of the order, while Zaheer Khan was unbeaten on 94 as as Westcroft reached 215-5. While Alex Walker (50) and Rajet Nahar (45) put things right after losing opener John Collings for an early duck, North Crawley came up on 203-9, 12 runs shy of victory - their lead at the top now cut to 19 points.